I was told by a children's lit prof once, that some of the students in his class, after reading my books, were sure there were drawings and paintings in them. Some argued with him until shown the book in question. That stays in my memory as one of the really good things said about my work. Maybe it's because I'm a painter, I don't know - but I do "see" my characters and settings as I write them. They move across my inner cinema screen very clearly. I want colour in my writing. I want pattern and shape and strong visuals for my reader. But I also want them to be able to take what I give them and form their own images - of my characters and settings - not as flat, sterile gray things, but as vibrant living images. Writers who can make my imagination "see" things visually, and in full colour, are my favourite writers. When I can envision their characters and their settings, I can then smell their seas, their lakes, their streets and their rooms and hear their characters' voices. I am transported to their worlds and it becomes as real to me as the room I'm sitting in. I think that's why I reread so many books. I become homesick for their sounds, their views, their lives, their "air". As I painter, I'm also touched strongly in the same way, but "differently", by certain paintings. 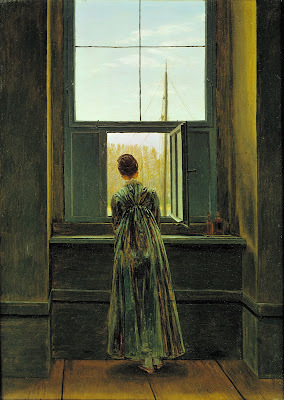 I saw this painting (above) by Casper David Friedrich recently, an 18th-19th C. German painter, called "Woman in a Window" and was immediately inside that room with the young woman. Friedrich is now considered to be an icon of the German Romantic movement and a painter of international importance, although he died ill and in obscurity. His work is unapologetically intense and romantic. Each painting tells its own story. In this painting I can hear the creak of the floorboards, the sounds of gulls and smell the sea air. 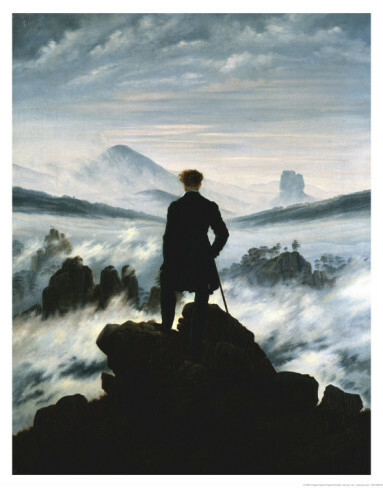 Friedrich's next painting (below) also hit me strongly, but in a different way. 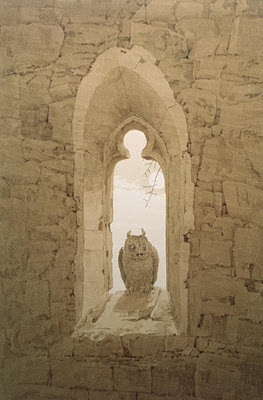 I "recognized it", because it looks so much like Emma Sweeney's best friend Tom (Tamhas) in his owl form in "The Watcher's Trilogy"; my fantasy novels: The Watcher, The Seeker and The Finder. 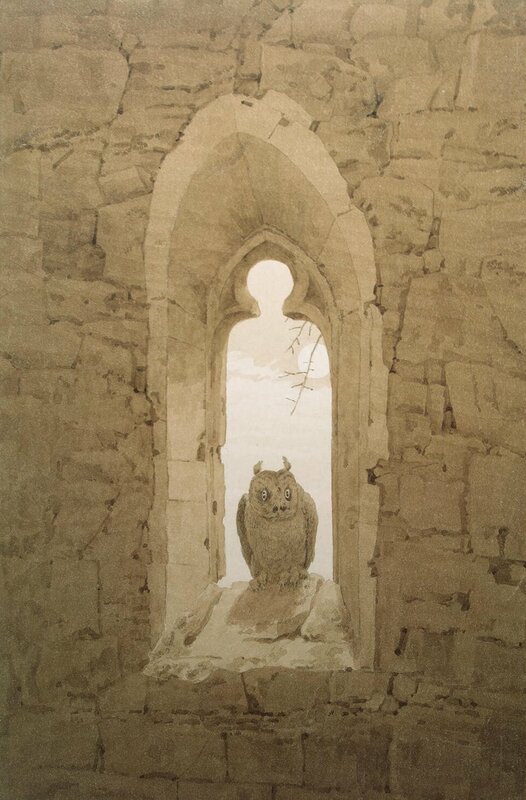 Tamhas often sits on a window ledge in the castel (castle) walls trying to reason with the impetuous Emma. There is a mood to this work that can only be truly captured through visual art, but I hope I was able to capture a similar mood with words. The shapes and colours in this painting have an atmosphere that sets a strong mood despite the soft tonal quality. It seems almost "modern" in its simplicity. And yet, romantic as well. This one below also intrigues me and has been used as a synonym for "romantic" online. It is utterly romantic and wild. Many people would find it too much so. But, ahh, there has to be a story there.... don't you think? There has to be a story in that last one. Great post Margaret! Karen - You are so lucky to have seen them. I don't know if it is a painting of a writer. But she seemed to be one to me. I love your last comment. "We peer into the worlds of our imaginations, soaking in the details and relaying them to our readers." Is that your own? If it is, it's wonderful. Please let me know. I may have to keep that and use it as a quote of the week by you!! Ooh, I have that last painting saved as part of my desktop wallpaper. I've got paintings for most of my main characters!